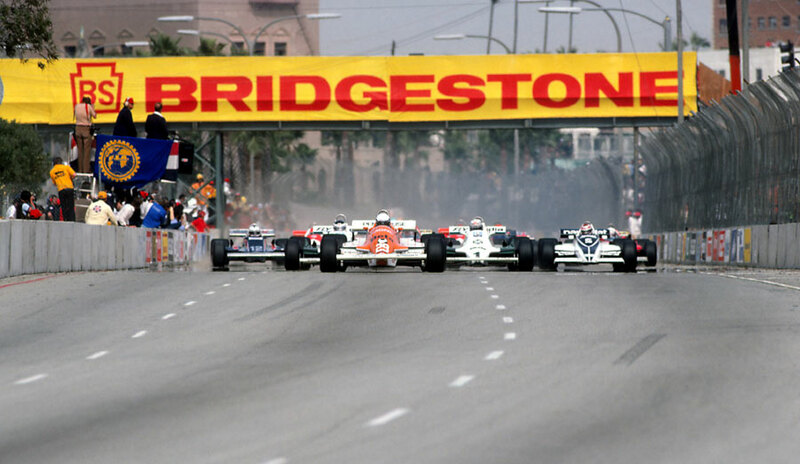 The season started with victory for defending world champion Alan Jones at Long Beach, suggesting it was going to be another long campaign for Williams' rivals. Despite rule changes which removed skirts from cars, it was as-you-were in the USA. There was also controversy when the new twin-chassis Lotus 88 was banned after protests by 11 other teams as officials decided it was outside the spirit of the new rules as it used an aerodynamic on a moveable part of the car. It was out on track practising on the morning of the race when it was black flagged. Riccardo Patrese had taken pole position, the first of his career - telling journalists it was "a surprise for me and for everyone else" - for Arrows and was the centre of attention after qualifying. When the race began, Patrese made the best start to lead the Williams of Carlos Reutemann who jumped team-mate Jones who had too much wheelspin. Half way around the lap, Gilles Villeneuve's Ferrari made a move for the lead and tried to charge around the outside of the leaders. He ran out of road and slithered wide allowing Patrese and Reutemann back ahead of him with Jones nipping past as well. Alain Prost had a forgettable debut for Renault as he failed to complete the first lap after a collision with Andrea de Cesaris. Patrese started to build a small lead over the Williams pair but after 24 laps the Arrows' engine started to hesitate and the Williams of Reutemann went ahead followed shortly after by Jones. Patrese was soon in the pits with a fuel blockage. Reutemann undid his lead by locking up and sliding wide when he was trying to lap Marc Surer's Ensign and this allowed Jones into the lead. Once ahead, he was unstoppable and ran out the winner from Reutemann with Nelson Piquet third for Brabham. The consensus at the end of the weekend was that the new rule changes had not made much difference to the pecking order, but they had impacted on speed. Times were around two seconds a lap slower than the previous year.